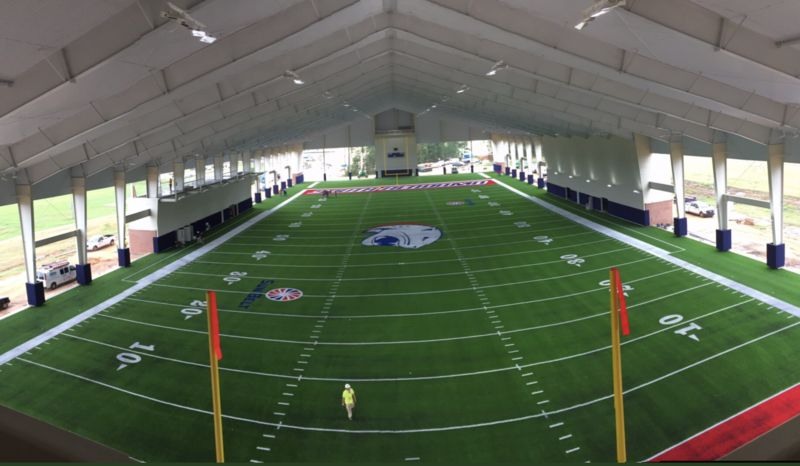 Last week, the finishing touches were put on the University of South Alabama’s indoor practice facility. The state-of-the-art facility will be primarily utilized by the Jaguar football team, but it will also be available for other athletic department and university functions. The 96,000 sq. ft. facility features AstroTurf’s 3D3 system, a performance turf system that combines slit film and monofilament fibers for optimum durability and visual appeal. It is highlighted by AstroTurf’s RootZone sub-layer, a texturized fiber that stabilizes infill and improves shock absorbency. When turf systems without a rootzone are spun at high revolutions per minute in a centrifuge type device they lose 75.4% of their infill. By comparison, AstroTurf’s Rootzone fields in the same test lose only 19.3% of infill. This not all means virtually no rubber spray out, but reduced maintenance as well. The jaguars took the field on Thursday, August 2nd for their first practice under the lights of their new facility. “Everything was done first class, from the turf, to the padding, to the graphics on the field. It is definitely a beautiful facility” – Head Coach, Steve Campbell said. Coach Campbell believes the facility, which is the largest of its kind in the state of Alabama, will be crucial for recruiting for not only athletics, but for overall student population as well.